Beets are the root portion of a vegetable. The bulbous root is eaten, but the leaves of beets may also be eaten raw, steamed, or juiced. There are both benefits and drawbacks to consuming beet juice. After talking to your doctor about whether beet juice can contribute to your optimal health, you may opt to make it a part of your daily diet. There are potentially positive side effects to drinking beet juice. An individual may experience one, some, all, or none of these benefits when regularly consuming the beverage. Beet juice can temporarily lower blood pressure. A study in the medical journal Hypertension in 2008 demonstrated that drinking two cups of beet juice a day lowered blood pressure by 10 points. This surprised researchers because the beet juice actually lowered blood pressure better than some prescription medications! The effects lasted for about 24 hours. Another study published in Nutritional Journal also presented results of a study that concluded that beetroot juice lowers blood pressure in healthy men when they drink it as part of a normal diet. Of course, be sure to talk to your doctor about treating your hypertension naturally to be sure it won't interact negatively with medications you are currently taking. Beet juice is also rich in a compound called nitric oxide (NO), which relaxes blood vessels, as reported by the American Heart Association. This compound also has anti-inflammatory properties and discourages blood clot formation. Cancer-fighting benefits of beets include a compound called betacyanin. It improves cell respiration and stops or slows the growth of cancer cells. Combined with the many other beneficial elements in other vegetables such as broccoli, carrots, and celery, these compounds act as a natural cancer-fighting "cocktail." Remember, many alternative cancer treatments have not been conclusively proven through conventional research, but they do offer an intriguing glimpse into what the average person should consider consuming in the quest to remain healthy. Just as how not everyone will experience the potential benefits, how beet juice affects someone in a negative way varies greatly from person to person. If you're drinking a lot of beet juice, your urine or stools may take on a peculiar pink or red color. This is called beeturia. It's a side effect of drinking lots of beet juice. Rest assured that it is harmless. However, it can scare you, especially if you don't know that it's caused by the betalain pigment secretions. If you ever had kidney stones or currently have a kidney stone, refrain from drinking beet juice. The high oxalate content may increase the likelihood or severity of kidney stones. 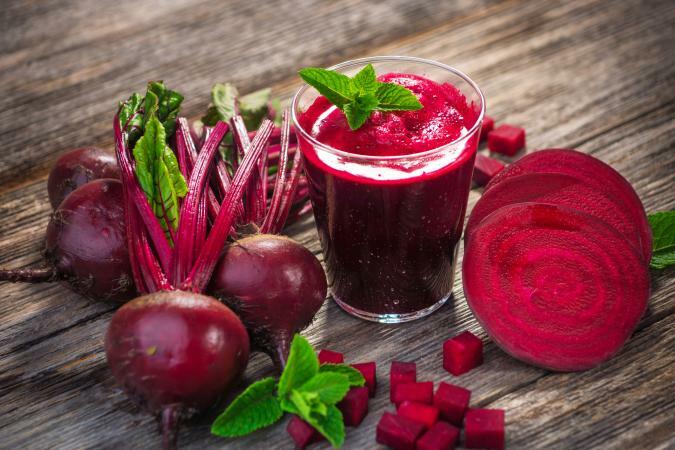 Avoid drinking beet juice until you get the all-clear from your doctor. A feeling of tightness in the throat or trouble speaking can be a side effect of drinking too much beet juice. Most sources state that drinking beet juice in conjunction with apple juice or other fresh vegetable juices in a vegetable juice cocktail seems to prevent this unusual and infrequent side effect. Although these side effects are infrequently reported, some people have reported experiencing fever, chills, and rashes after consuming beet juice. If you think you're suffering these effects from drinking beet juice, stop drinking it. If the problem persists, see a doctor. Rashes may indicate an allergy. Sometimes detoxification and cleansing creates temporary symptoms such as a low fever or chills. This is one possible explanation of why beet juice may create this side effect. If it improves cellular respiration as conventional science states, one possible theory is that the cells are better capable of releasing stored waste, and if many cells release waste at once, it can cause slight flu-like symptoms. Of course, you could really have the flu, or possibly another illness, so if the symptoms persist after stopping the beet juice, see your physician. Keep in mind that if you mix beet juice with other freshly pressed vegetables juices, the negative side effects are minimized while you still reap the nutritious benefits of beet juice. Whether you should drink beet juice will depend on your personal health concerns and tolerance. Just be sure to check with your doctor before adding it as a regular part of your diet. Drinking beet juice is a common recommendation for people with cancer, people seeking a cleansing and alkaline diet, and for those who enjoy a raw, vegan diet. Benefits of drinking beet juice include its cancer-fighting abilities as well as superb nutrition and antioxidants. Beet juice is rich in folate, potassium, manganese, iron, vitamin C and other vitamins and minerals. It's also low calorie and fiber rich, making it a great food for people trying to lose weight. Ounce for ounce, beet juice is a healthy drink. Combined with other fresh vegetable juices, it's a tonic packed with vitamins, minerals, fiber and antioxidants. Beets are inexpensive, easy to juice, and taste good.